There are a number of things you can do as you wait and laze around Kampala before or after your Uganda Safari. We have a number of short exciting excursions that our clients can enjoy and the Kampala Jinja City Tour is one of them. The Kampala Jinja City Tour gives you a historical and cultural taste of Uganda’s two oldest cities, capital Kampala and Jinja where the source of the mighty Nile if found. Uganda’s capital city of Kampala borders Lake Victoria, Africa’s largest lake. The downtown area of Kampala offers a multitude of historical and cultural attractions for visitors to explore. Jinja, Uganda’s colonial town with some of the oldest buildings in the nation, also commonly called the adrenaline capital of East Africa is the most commonly visited town for anyone on a safari in Uganda. Many activities take place here like Whitewater rafting, bungee jumping and a boat ride up-to the point where the Nile River begine. Kampala is the largest town in Uganda and the capital city. It is usually referred to as a city of seven hills because it is built on seven different hills. Kampala city has interesting places to visit and our excursion will take you around the many interesting places and beautiful scenes it has to offer. The Kampala City Tour starts with a hotel pickup where you will then proceed to the following interesting places in the presence of a knowledgeable and humorous English speaking guide. Jinja was previously the capital city of Uganda. The town is well known for being the source of the Nile at Rippon Falls. Owen Falls damn provides electricity for the whole of Uganda and is located downstream from the Nile’s source. The source is from lake Victoria and then stretches 4000 miles up to the Mediterranean sea. The Jinja City Tour starts with a hotel pickup where you will then proceed to Jinja along the Kampala-Jinja road highway. Here you will get to see the sugar cane plantations at Lugazi and Kakira. You stop at Mabira Forest and see different primates and birds. Uganda Safaris Also different species of trees are there to see. You move on towards the source of the Nile and the Owen falls dam. Have a meal at Samuka Islands. Lastly, head to the Bujagali falls, a converging point for many water rapids and see swimmers and listen to the rushing sound. Head Back to the city in the evening. 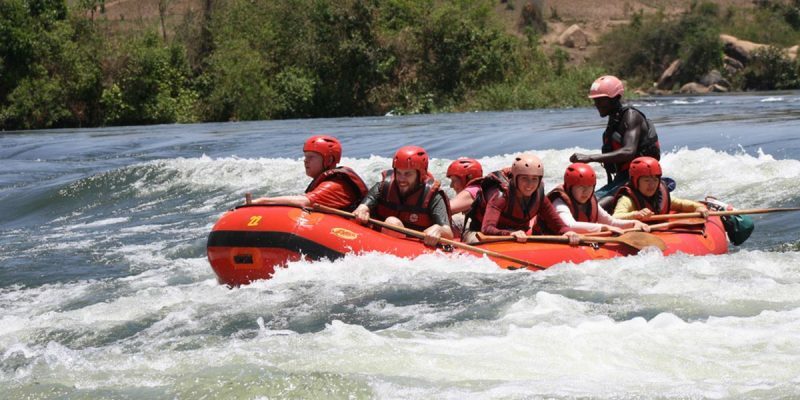 Enjoy wild water rafting along the source of the river Nile. All white water trips are open to anyone aged 16 or above and no experience is required. Most of people have never rafted before, all training and equipment is provided on the day. All whitewater adventures include a pickup from your hotel in Kampala, high quality custom made lifejackets for extra buoyancy and comfort, a great buffet lunch on a beautiful mid-river island, an awesome rafting experience and as much beer, soda and water as you can manage! The Nile High Bungee has to be one of the most visually impressive bungee jumps in the World! Kites and fish eagles circle the tower as thrill seekers prepare to jump 44 meters directly down to the source of the Nile. The Nile High Bungee has been created using world-leading innovation to make the jump a state of the art personal challenge experience. Safety and environmental sustainability are of utmost importance and the site has been constructed to the most exacting international standards set in New Zealand and Australia. Be amongst the first to bungee jump into the source of the Nile. Don’t miss out on the action. Take the plunge.